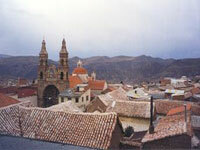 UNESCO declared Potosi a World Heritage Site because of its rich history and colonial-era Spanish architecture. Tourists will find the destination at the foot of the Cerro Rico (Rich Mountain), which is famed for its silver deposits. Indeed, the Spanish founded the city to access the mountain's wealth. Potosi went on to become the largest city in the Americas, but fell into sharp decline once much of the silver had been plundered. Architecture is undoubtedly Potosi's main attraction, with a distinct Spanish influence evident in its houses and beautiful churches. The city's colonial churches are filled with art and artefacts from its long history. Many travellers complement city visits with tours of Cerro Rico's cooperative mines. Though very interesting, the mines are emotionally harrowing and there are physical risks involved.